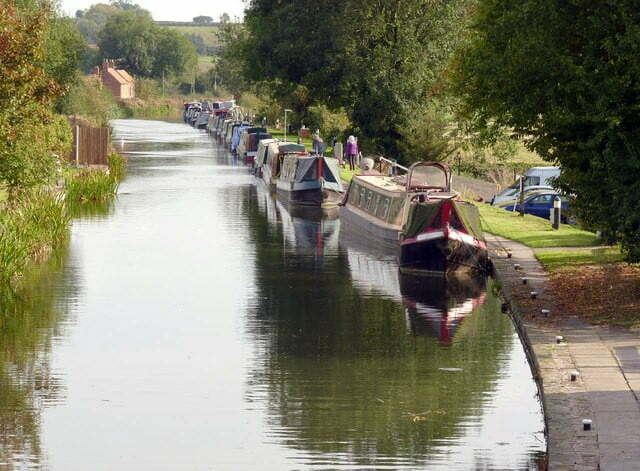 Known locally as 'Cuckoo Dyke', Chesterfield Canal is a barge canal in the north of England. The Chesterfield Canal was opened in 1777 and ran 46 miles (74 km) from the River Trent at West Stockwith, Nottinghamshire to Chesterfield, Derbyshire. The route of the canal was surveyed by James Brindley and John Varley. There were 65 locks in all, with two tunnels: a short 154-yard (141 m) tunnel near Gringley Beacon, and the major 2,880-yard (2,630 m) long Norwood Tunnel. It is currently navigable as far inland as Kiveton Park near Rotherham, South Yorkshire, plus an isolated section near Chesterfield. Tapton Lock Visitor Centre is located on the Chesterfield Canal to the north of Tapton Park. Incidentally, Tapton House was once the home of the incredible engineer George Stephenson! The canal was built to export coal, limestone, and lead from industrially delicious-Derbyshire, iron from Chesterfield, and corn, timber and, groceries into Derbyshire. The stone for the Palace of Westminster was quarried in North Anston, Rotherham, and transported via the Chesterfield Canal. The canal was a success when it opened in 1777, however the Manchester, Sheffield and Lincolnshire Railway opened a parallel line in 1849. The last commercial traffic was in 1908. The building and development of a canal network played a key, although short-lived role in the development of UK transport and industry. This network largely remains today providing green corridors valuable to both human and wildlife populations. See the wiki page – HERE!